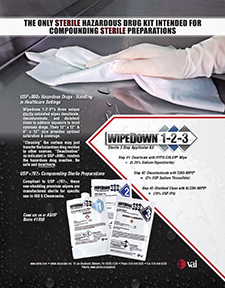 Texwipe is the global leader in contamination control and critical cleaning supplies and products. Headquartered in Kernersville, North Carolina, Texwipe supports global customers with sales offices throughout North America, Europe and Asia. Manufacturing centers located in North Carolina, Philippines, and China which provide the highest levels of quality and manufacturing technology. 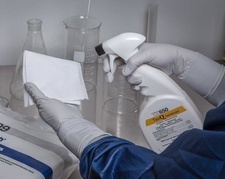 With over 50 years of experience in the contamination control industry, Texwipe offers contamination control products, technical resources and support, process audits, hands-on training seminars, posters and application specific training on how to achieve contamination control your critical, controlled, and sterile environments. 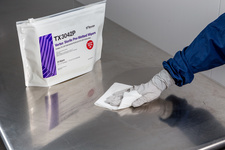 Texwipe's broad product line includes a complete array of sterile and non-sterile wipers, swabs, mops, cleaning solutions, disinfectants and stationery for use in cleanroom and controlled environments. 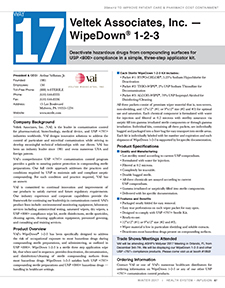 Texwipe also develops custom products to address specific customer needs. We are working with the leaders in technology-driven industries to apply our expertise in ever expanding ways. If you are looking for the best in the business, contact us today by using the link below. 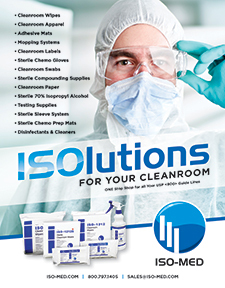 ISOlutions for your Cleanrooms and Medical Supplies! 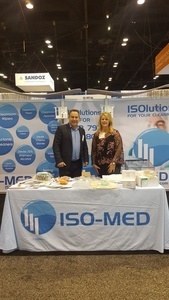 California-based corporation was formed to supply quality products for the biotechnology and healthcare industries in the United States. 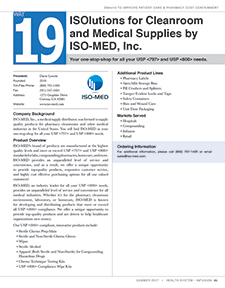 ISO-MED provides an unparalleled level of convenience for our customers. 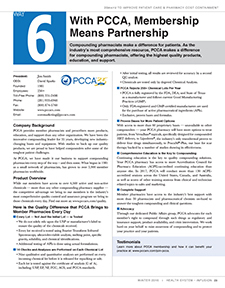 As a result, we offer a unique opportunity to provide top-quality products, responsive customer service, and highly cost-effective purchasing options for all our customers. 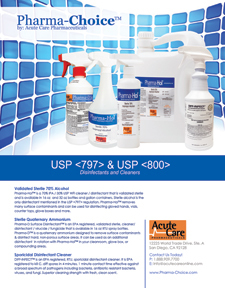 Our ready-to-use, USP <797>-friendly sterile cleaning products give you the tools you need to kill bacteria and maintain a clean medical environment free of contaminants and debris. 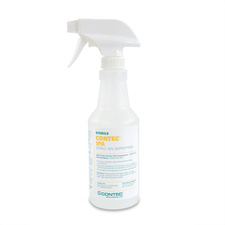 This series of powerful sanitizers and disinfectants includes sprays, wipes and polish individually bagged and ready for immediate introduction into the controlled area. Products include Sterile Hydrogen Peroxide, Sterile Sodium Hypochlorite, Sterile Alcohol, Quaternary Ammonium, Sterile Decon-Clean SimpleMix, Decon Spore SimpleMix, Sterile USP Purified Water and Sterile Stainless Steel Cleaner and Polish. 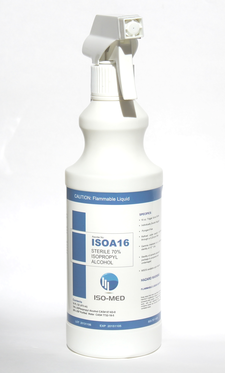 Premixed concentrations are formulated with sterile Water For Injection (WFI), sterilized and filtered to eliminate any trace of particulate matter inside the container. Two-part SimpleMix solutions measure and mix the appropriate amount of concentrate at the time of use to guarantee a fresh, full-strength solution every time. 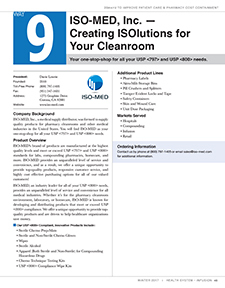 Provides sterilized cleanroom garments to customers with aseptic environments. Ensures the sterility of its garments through strict compliance to cGMPs and through validation of the sterilization process in accordance with current ANS1/AAMI/ISO11137 guidelines to a SAL of 10-6. 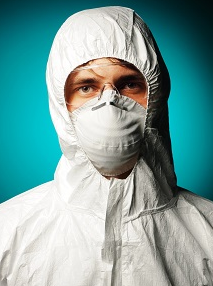 Uses qualified gamma irradiation method of sterilizing cleanroom garments and ancillary products. 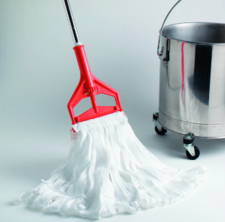 Why purchase mop heads and dispose of them when you can reuse them? Garment Tracking System (GTS) - GTS Bar-Code Tracking System provides our customers with a complete account history report for each garment from installation to any repairs. It also tracks usage analysis by wearer, department and distribution point. 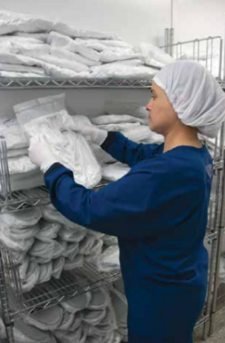 Accurate Garment Inventory Control By Department - Garments always returned to originated cleanroom after laundering is completed no matter where they land after use. This program places our trained employees at your location to allow continuous communication and just in time distribution for your reusable apparel within the change area. The program also provides a service to maintain correct inventory levels and stocking for our many available and related products. 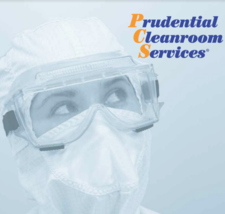 All Prudential Cleanroom Services products are Validated SAL 10-6 for our Aseptic customers. 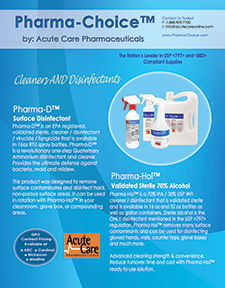 Advanced cleaning technology for healthcare. 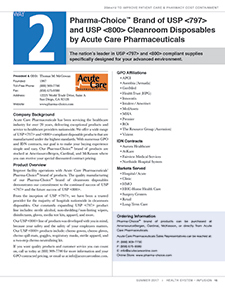 Contec Healthcare offers many products for cleaning in critical areas where USP <797> and USP <800> compliance is required. 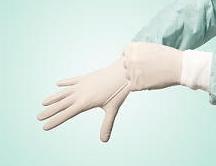 Our wipes, disinfectants, sterile alcohol, non-shedding mops, gloves and garments are used in pharmacies, hospitals, and other critical medical environments to clean, disinfect and decontaminate. 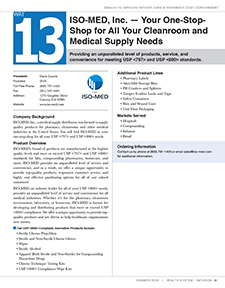 Most of our products, including sterile IPA and wipes, are made in the USA in our ISO 9001: 2008 registered cleanroom facilities. 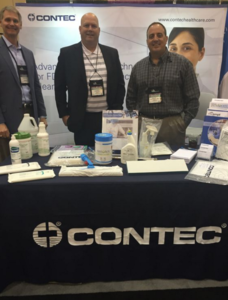 Let Contec�s 26+ years of experience provide solutions for all of your sterile compounding and hazardous drug decontamination challenges. Our experienced R&D and Technical Services teams understand the challenges of cleaning and disinfecting critical and controlled environments in a variety of complex industries. 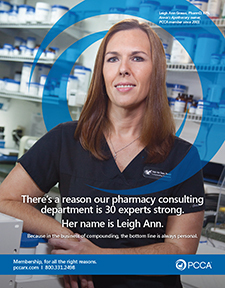 We are bringing that wealth of knowledge to the pharmaceutical and healthcare environments. 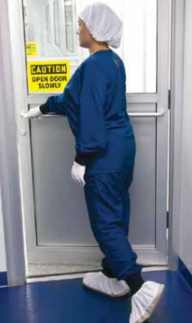 Contec provides a full line of cleanroom products enabling compounders to meet the ever increasing demands for cleaner, safer pharmacies. 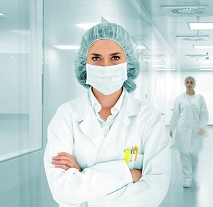 Our products are used in many medical environments to clean and decontaminate barrier isolators, laminar air flow hoods, cabinets, tables, ceilings, walls, and floors. 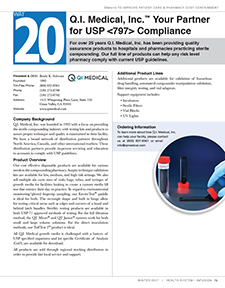 In the pharmacy, we understand the parameters of USP Chapter <797> and <800> regulations as well as ISO 14644 and will help your team meet these requirements. 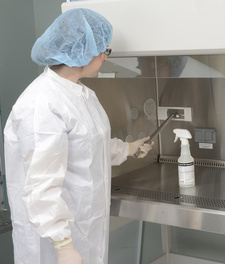 Whether you are cleaning your pharmacy�s primary engineering controls or decontaminating surfaces exposed to hazardous drugs, Contec offers industry-leading product solutions. designing the correct procedures that will improve your processes. To set up a free assessment and trial, contact us today. To learn more about Contec Healthcare or to request a product trial, call +1-864.503.8333 or email us through the Request Information link below. Micronova Manufacturing Inc. was established in Torrance, California in 1984. 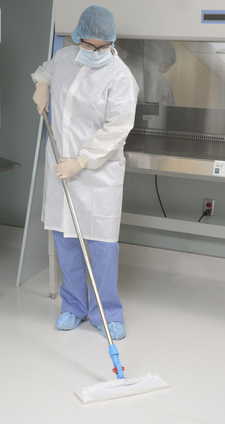 Recognizing the need for tools to address critical cleaning in aerospace and military installations, Micronova developed a range of cleanroom mops, wipers and detergents to serve the emerging cleanroom industry. With its CR 100 PC tape, Micronova was the first to develop specially processed cleanroom tape for controlled environments. In recent years Micronova has broadened its product range to meet the needs of aseptic processing in pharmaceutical and biotechnological sites. 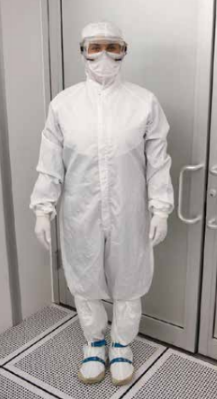 All manufacturing is carried out at the Torrance facility and Micronova's products are distributed and sold into cleanroom facilities worldwide. 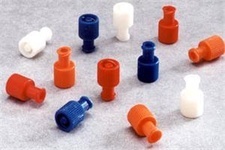 Micronova sells exclusively through distributors. 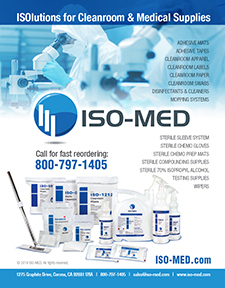 We have a network of U.S. and international distributors that specialize in certain geographical locations and/or types of cleanrooms. If you can let us know the type of industry you are involved in and the type of products you are looking to purchase we will provide you with the name(s) of a distributor best suited to your region and/or industry. 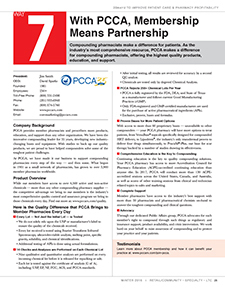 Providing an unparalleled level of products, service, and convenience for meeting USP <797> and USP <800> standards. 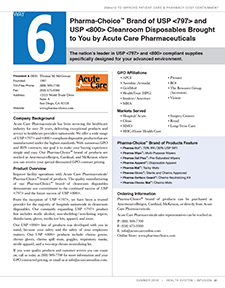 Deactivate hazardous drugs from compounding surfaces for USP <800> compliance in a simple, three-step applicator kit. 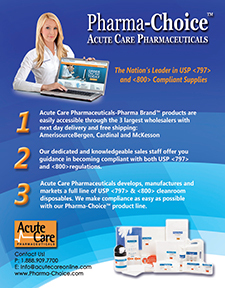 Your one-stop-shop for all your USP 797 and USP 800 needs. 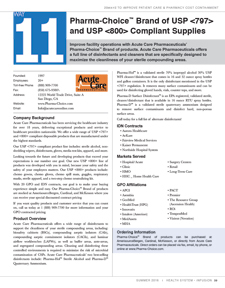 The nation's leader in USP 797 and 800 compliant supplies specifically designed for your advanced environment. 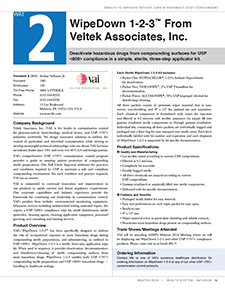 WipeDown 1-2-3  From Veltek Associates, Inc. The Leader in Critical Cleaning. 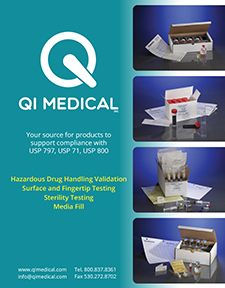 USP <797> & USP <800> compliant supplies available at your fingertips! 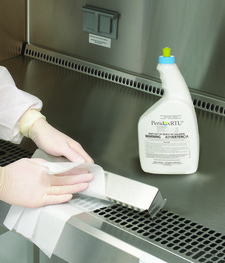 PeridoxRTU®, a ready-to-use-, broad spectrum EPA-registered sporicide, bactericide, virucide, tuberculocide and fungicide disinfectant and cleaner, has been proven to effectively decontaminate critical surfaces that come in contact with hazardous substances. 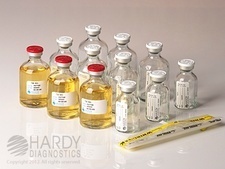 PeridoxRTU, an effective alternative to bleach, allows for proper containment- a major component of safe handling of hazardous drugs.